I’ve been interested in how David Bach's new book is being marketed. I noticed some bloggers have already posted reviews, which now seems to be de rigeur for personal finance books, but this is just one part of a really huge marketing campaign. 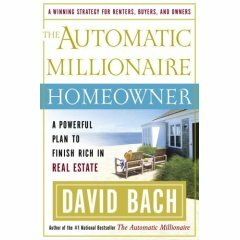 One of the most staggering things is that Bach has formed a strategic partnership with Wells Fargo, who will give away 750,000 copies of a paperback version of the book to their mortgage customers. This just blew my mind—only the tiniest fraction of books ever sell anywhere near that many copies, let alone having them given away. The announced first printing of the hardcover that will be sold in bookstores is only 350,000, which means that the publisher is really probably only printing about 250,000 copies to start, max. I find it bizarre that you would give away so many free copies to people who might potentially buy the book! But Wells Fargo presumably paid a pretty penny for the special PBs, so even if the author’s royalties are marginally less on that sale, he’s still getting a huge windfall from it, and the publisher must be getting a cut too. In a Publishers Weekly article about Bach, he comes right out and says that he set up the relationship with Wells Fargo out of frustration with his publisher. He’s right that publishers don’t spend much on advertising—the profit margins are thin enough as it is. Any publisher’s dream author is someone with their own built-in promotional machine, so the publisher doesn’t have to spend much on their own marketing and can just focus on printing the books and getting them out into stores! One way or another, I’m sure we will be seeing this book on bestseller lists any minute… and I’ll have to see if I can get it from the library or read it at my local shop so I don’t have to cough up $20. Either that or I'll have to find a Wells Fargo branch and see if I can pretend to be interested in getting a mortgage so they'll give me one of the free copies! Seems some people do well with real estate. Let us know how the book turns our. As I am new to blogging, could I get some tips on how to cut and past spreadsheet or chart images? Any advise or directions would be much appreciated. Madame X, I am a Wells Fargo mortgage customer and have been solicited by them for this event. There is going to be a homebuyers workshop at the Javits Center tonight actually at 6pm. David Bach will speak for an hour then I think it will be a homebuyer fair and everyone receives a copy of the book. Wells Fargo is really boosting this books sales...er, numbers. Interesting post! I've found your site very useful. You post great articles. As a Wells employee we did get copies of the book.